Vertical Multistage In-Line Armstrong Fire Fighting Selangor, Malaysia, Kuala Lumpur (KL), Rawang Supplier, Supplies, Keylargo Industrial Sdn. Bhd. Armstrong Series 4700, designed for temperatures ranging from 5°F to 250°F (-15°C to 120°C), are well suited for boiler feed applications, condensate recovery and air conditioning systems. Easy to incorporate into industrial environmental engineering equipment, our Vertical MultiStage pumps combine the advantages of compact design, quiet operation and ease of maintenance. 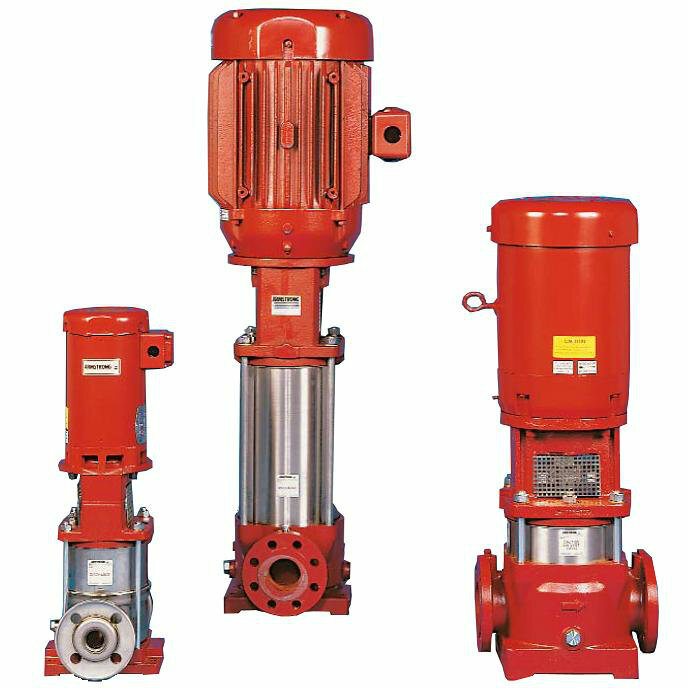 From basic water supply to the most specific pressure boosting and fire line pressure maintenance applications, Armstrong Series 4700 Vertical MultiStage pumps satisfy all water distribution requirements. The wide pressure range - from 10 psig to 430 psig (0.7 bar to 30 bar) - makes this product well suited for applications such as pressure washing of aircraft, trains, boats and road vehicles as well as spray washing of industrial parts and electronic components. Water feed to machine tools, grease removal, cooling of lathes and molds ... water has many uses in the industrial market. The stainless steel design and wide temperature parameters of the Series 4700 Vertical MultiStage pump makes it an ideal unit for light industrial applications. Water is becoming a precious commodity. Water transportation, demineralization, filtration, deionization and reverse osmosis all call for high pressure supply and hygienic considerations. The Armstrong Series 4700 Vertical MultiStage pump is made entirely with stainless steel wetted components, for most sizes and is well suited for these applications. The excellent hydraulic efficiency of the Armstrong Series 4700 makes this pump a great choice for irrigation and sprinkling applications. Whether irrigating large farms or sprinkling parks and golf courses, the Armstrong stainless steel pump stages provide the best hydraulic efficiency in all power ranges. The compact design allows the best utilization of available space in pumping stations.